Because vaccines and other perishable items are sensitive to extreme heat and cold, at certain times of the year Pet Supplies 4 Less will ship these items via Overnight Service or 2nd day only. Overnight Service orders are shipped Monday-Thursday. Orders placed after 11 a.m. CT will be processed the following day. Orders received after 11 am CT on Thursday will be shipped the following Monday. If you have any questions regarding this policy, or wish to inquire about other shipping methods, please call 877-813-7387. We cannot ship 2nd Day & Overnight Packages to a PO Box. 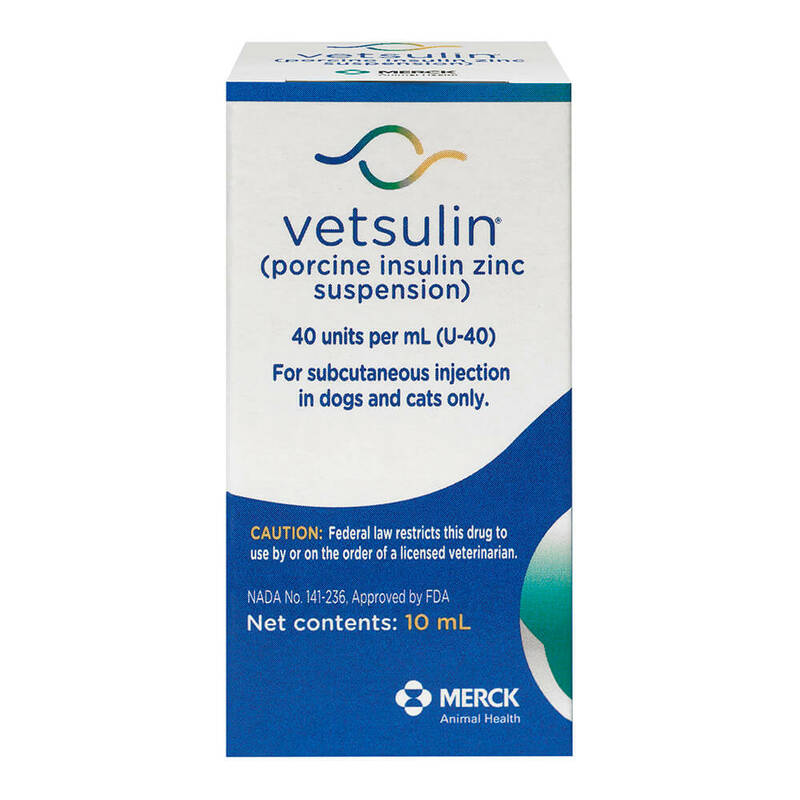 Vetsulin® is a sterile aqueous zinc suspension of purified porcine insulin. Vetsulin® is indicated for the reduction of hyperglycemia and hyperglycemia-associated clinical signs in dogs and cats with diabetes mellitus. Recommended dosages only. Always follow the directions for dosing and administration from your veterinarian. For subcutaneous injection in dogs and cats only. Shake the vial thoroughly until a homogeneous, uniformly milky suspension is obtained. Foam on the surface of the suspension formed during shaking should be allowed to disperse before the product is used and, if required, the product should be gently mixed to maintain a homogeneous, uniformly milky suspension before use. Clumps or white particles can form in insulin suspensions: Do not use the product if visible clumps or white particles persist after shaking thoroughly. Using a U-40 insulin syringe, the injection should be administered subcutaneously, 2 to 5 cm (3/4 to 2 in) from the dorsal midline, varying from behind the scapulae to the mid-lumbar region and alternating sides. The initial recommended Vetsulin® dose is 0.5 IU insulin/kg body weight. Initially, this dose should be given once daily concurrently with, or right after a meal. Twice daily therapy should be initiated if the duration of insulin action is determined to be inadequate. If twice daily treatment is initiated, the two doses should each be 25% less than the once daily dose required to attain an acceptable nadir. For example, if a dog receiving 20 units of Vetsulin® once daily has an acceptable nadir but inadequate duration of activity, the Vetsulin® dose should be changed to 15 units twice daily. The veterinarian should re-evaluate the dog at appropriate intervals and adjust the dose based on clinical signs, urinalysis results, and glucose curve values until adequate glycemic control has been attained. Further adjustments in dosage may be necessary with changes in the dog's diet, body weight, or concomitant medication, or if the dog develops concurrent infection, inflammation, neoplasia, or an additional endocrine or other medical disorder. The initial recommended dose in cats is 1 to 2 IU per injection. The injections should be given twice daily at approximately 12 hour intervals. For cats fed twice daily, the injections should be given concurrently with, or right after each meal. For cats fed ad libitum, no change in feeding schedule is needed. The veterinarian should re-evaluate the cat at appropriate intervals and adjust the dose based on clinical signs, urinalysis results, and glucose curve values until adequate glycemic control has been attained. Further adjustments in dosage may be necessary with changes in the cat's diet, body weight, or concomitant medication, or if the cat develops concurrent infection, inflammation, neoplasia, or an additional endocrine or other medical disorder. Storage Conditions: Store in an upright position under refrigeration at 2° to 8° C (36° to 46° F). Do not freeze. Protect from light. Use contents within 42 days of first vial puncture. Reproductive Safety: The safety and effectiveness of vetsulin® in breeding, pregnant, and lactating dogs and cats has not been evaluated. Use in puppies and kittens: The safety and effectiveness of vetsulin® in puppies and kittens has not been evaluated. User Safety: For use in animals only. Keep out of the reach of children. Avoid contact with eyes. In case of contact, immediately flush eyes with copious amounts of water for 15 minutes. Accidental injection may cause clinical hypoglycemia. In case of accidental injection, seek medical attention immediately. Exposure to product may induce a local or systemic allergic reaction in sensitized individuals. Animal Safety: Owners should be advised to observe for signs of hypoglycemia. Use of this product, even at established doses, has been associated with hypoglycemia. An animal with signs of hypoglycemia should be treated immediately. Glucose should be given orally or intravenously as dictated by clinical signs. Insulin should be temporarily withheld and, subsequently, the dosage should be adjusted, if indicated. Any change in insulin should be made cautiously and only under a veterinarian's supervision. Changes in insulin strength, manufacturer, type, species (animal, human) or method of manufacture (rDNA versus animal-source insulin) may result in the need for a change in dosage. Appropriate diagnostic tests should be performed to rule out endocrinopathies in pets that are difficult to regulate (e.g., hyperadrenocorticism in dogs and hyperthyroidism in cats). NOTICE: This item requires special shipping!